Dunnett Places to Visit - South and "Midculter"
This is the small town nearest to which both Boghall Castle - the historical but now ruined and almost disappeared home of the Flemings - and the ficticious Midculter, home of the Crawford family, are situated. The town can be reached from Edinburgh by car on the A702 - around 29 miles or 55 minutes. Incidentally much of the course of this road is originally Roman. An alternative route on the A72 would take you through Blyth Bridge and Kinkurd. One interesting if non-Dunnett item in Biggar is the Gasworks Museum which is apparently unique. 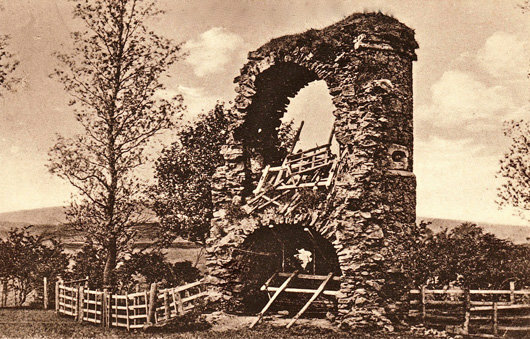 There is very little visible of Boghall now - just the remains of a couple of the corner towers of the old walls in a farmer's field - but there are photographs of it, including one taken in the early 20th century, which shows what may be the gatehouse with walls about 20 feet high. 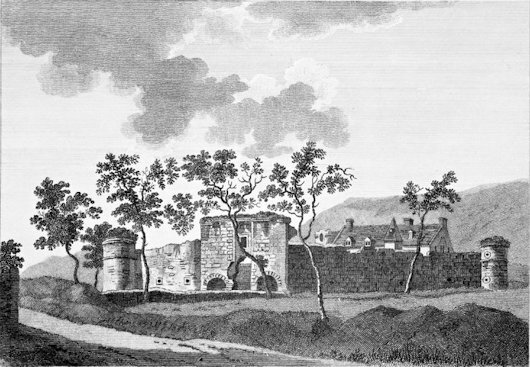 There is also an engraving which shows it with a house inside the walls and another from around 1775 which shows it shortly before it started to decline. Despite the somewhat uninspiring name, Boghall was always considered of great strategic importance due to its position where the upper reaches of the Clyde and Tweed valleys meet, and that, along with the Roman road leading to Edinburgh, gave it great value. At one time it was one of the most imposing castles in the southern areas of Scotland. The land was granted to Flemish Knights by David I as he sought to bring culture and learning to Scotland in the 12th century, and it was from this that the name Fleming developed. 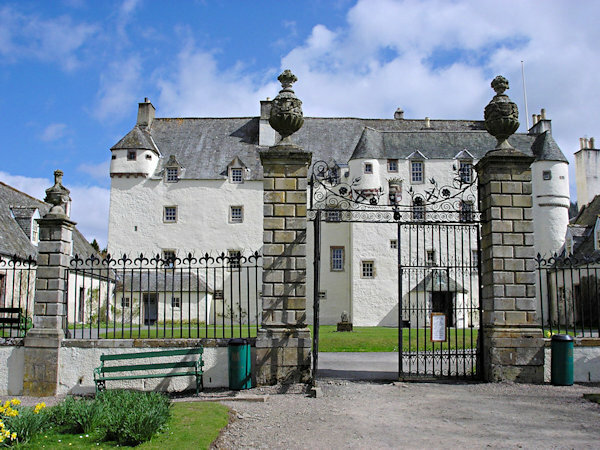 It is thought that the castle was built in the 13th century to replace a motte and bailey structure in Biggar itself. 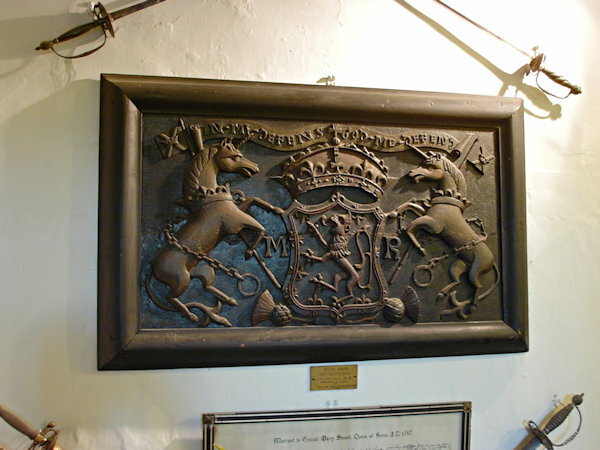 Robert Fleming was made the 1st Lord Fleming in 1460 and the family had a lot of influence during that period. It is believed that the castle was extended in 1492 by Malcolm Fleming. The castle was, as the name suggests, surrounded by very boggy ground which acted as a defensive feature. To supplement this there was a courtyard wall, almost a metre thick and 9 metres high, with round towers at three of the corners. Outside the wall was a deep water-filled moat. 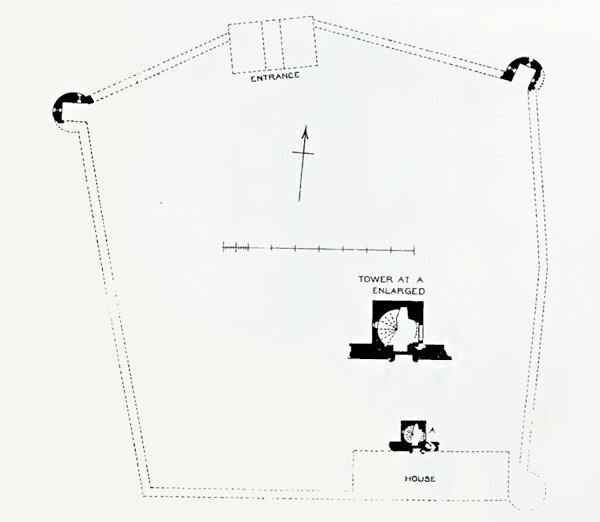 Inside teh walls was a an L-plan tower house. 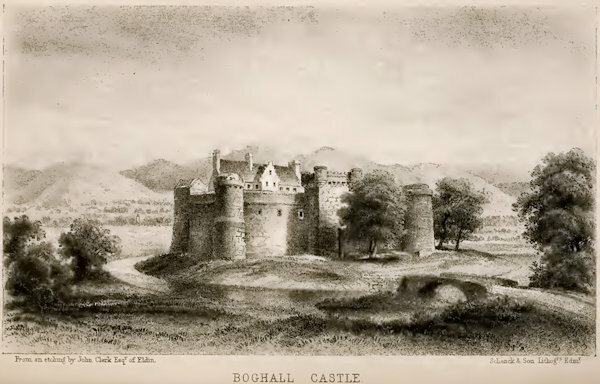 Mary Queen of Scots stayed at Boghall in 1565. The 5th Lord Fleming fortified Dumbarton Castle for her in 1570 but while doing so Regent Lennox’s supporters besieged and took Boghall. The castle was again beseiged and captured 80 years later, by Oliver Cromwell, and it's thought that he may have stayed there himself. A new mansion house replaced the tower house in 1670 but by the mid 18th century the castle had passed to the female line and into the Elphinstone family. 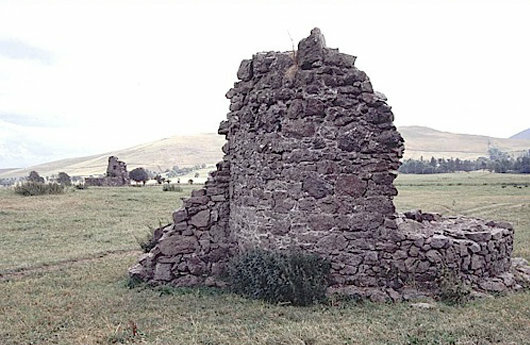 However they don't appear to have lived there and by the end of the 18th century the castle was becoming derelict and within the next few years it was progressively dismantled and the stone reused. The following map of the area is well worth experimenting with. If you are based outside of the UK change your location setting within Bing to UK and you'll find that at certain magnifications you'll get the option of the superb British Ordnance Survey maps rather than just a road map or aeriel view (though the latter is also very useful). This will give you a lot of detail including old archaeological features, and will give you a much better feel for the surrounding country. 3 miles further south-west is the tiny village of Coulter, along with Coulter Mains, and Culter Allers House. There is also Culter House, an elegant 17th century laird's house with attractive grounds. This would certainly be the area that Dorothy had in mind for the Crawford's Midculter Castle. About 2km north there is also Coulter Motte - a castle mound believed to be around 12th century but about which there is hardly anything known. Reputed to be the oldest inhabited building in the country, the first documented evidence of its existence is in Alexander's reign in 1107. 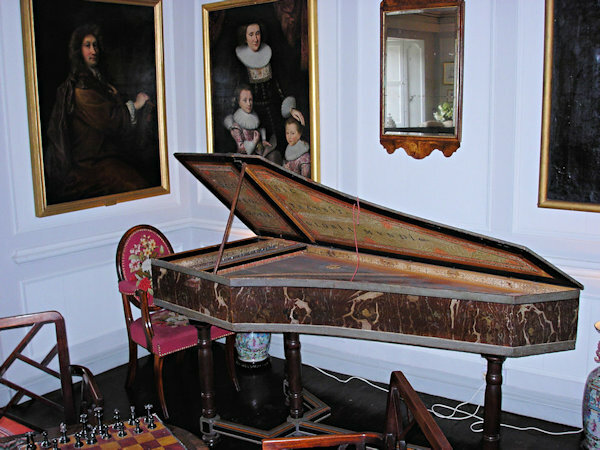 It has played host to many of the kings and queens of Scotland, and contains the crib of James VI. It is entered by the side gate as the main entrance - the Bear Gates - are shut. Tradition says they were closed behind Charles Edward Stuart and were not to be opened until a Stuart was back on the throne. While not directly connected to the books, being only peripherally mentioned in The Disorderly Knights, it is a must-see if you want to get a feel for the sort of buildings that our more noble characters would be familiar with and lived in. 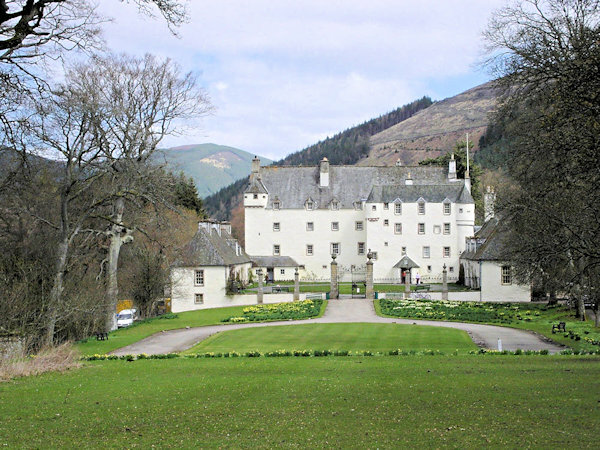 We visited Traquair as part of the Dunnett Weekend some years ago, and found the history fascinating. 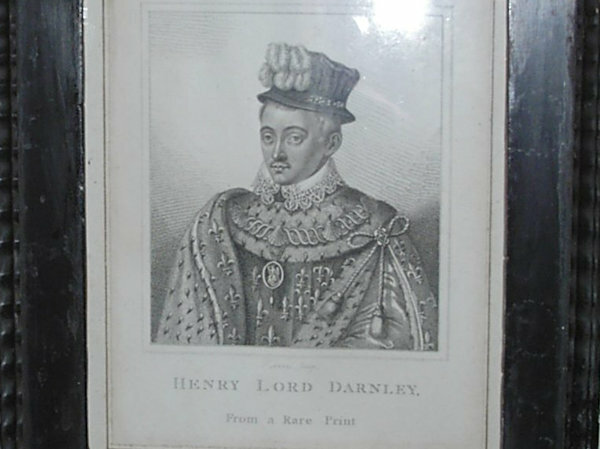 They have a portrait of Darnley as a young boy, an old harpsichord of a type that we can imagine in Kate's music room, and a very old strongbox, amongst many other interesting items. Amongst its other attractions is the range of traditional beers brewed on the premises in the old brewery which was reopened in the 1960s. The house is these days owned and run by Catherine Maxwell-Stuart - a relative of our Jack Maxwell as well as Mary Q of S. Apparently if the Stuarts hadn't been deposed she would have a strong claim to the Scottish throne.